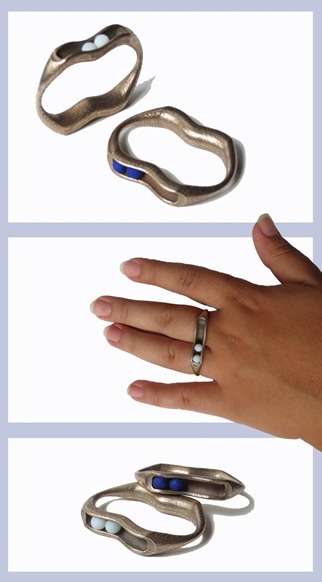 Fidget Ring Review and Giveaway : Kinetic Rings for Restless People and Kids ! Successful innovators are just that because they are able to tap into an unmet need. 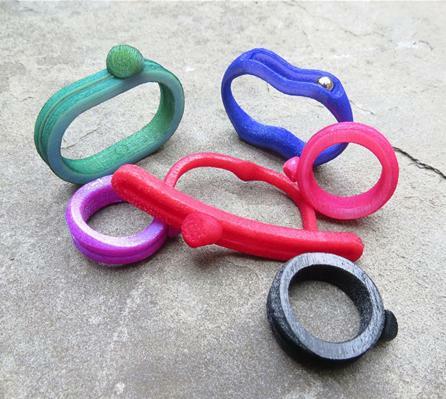 One shining example is Washington DC artist, Meg Dattoria, came up with her clever collection of kinetic rings called Fidget Rings to help anxious or really restless people. She knows all too well what a fidget feels and does because she is one herself. Meg realized her habit of moving her legs and feet especially when engaged in a low energy activity like watching tv was disruptive to those around her. But she needed to fidget "to calm her anxieties and focus her mind." She is not alone as many of us have different ways of fidgeting - twirling locks of hair, tapping feet, biting fingernails are but a few examples. As Meg herself wrote in her thesis paper, rhythmic sensory stimulation is not a new concept - for example, oral mantras have been used for thousands of years as an auditory focusing technique. So how do they work? 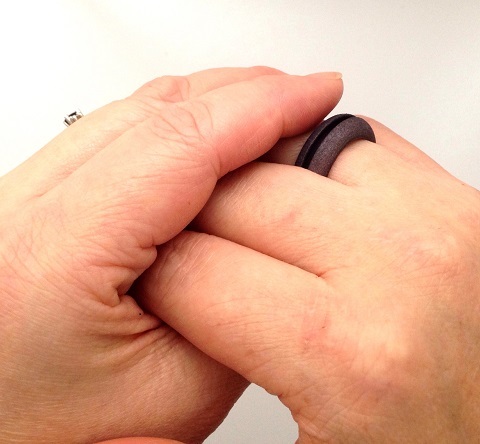 Meg sent me a couple of her fidget rings (shown below) for review - the current Slide 1 ring as well as an earlier prototype all-nylon version which is more durable. The final design will have ths same band as the original but with a flatter slider. The new design will be out later this week. There is also a Slide 1 ring available for a lucky winner in his or her choice of size and color. The Slide 1 is the simplest of her designs. The rings are made such that the slider can be moved along the whole channel or just to and fro. I had no trouble selecting my size using one of my own rings and her ring sizing chart (in the About section). The rings are on the bulky side but comfortable enough to wear. While the slider looks like a typical ring focal, one has to remember the function of the ring, This focal moves! The prototype slider moves more smoothly than the original. Having the slider below means one can fidget by manipulating it with one's other hand underneath. So no one can see you fidgeting! The slider does make a slight sound when moved but won't be noticeable in normal environments. I will try it out in at the cinema as I often get the fidgets during slow parts of a movie. Far better than shuffling constantly in my seat and annoying my neighbors! Shown here are some of the other designs including the metallic ones. She used 3D computer software to design the rings. The plastic created with a combination of hand metal work and 3D printing with an acrylic photopolymer. She hand dyes them in a variety of colors. The metal ones are made from a bronze-steel composite. She also has one necklace design - the Spin in brass. 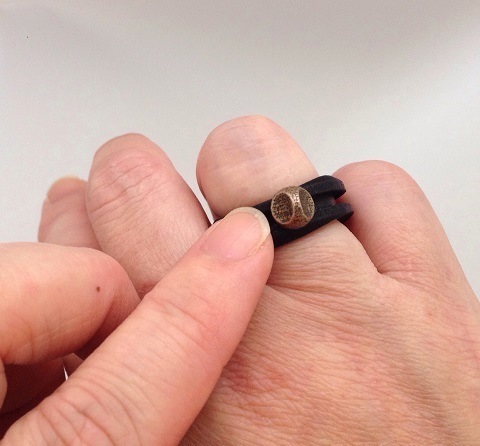 Her designs "mimic the natural way our hands move when we fidget". The rings also help individuals with ADHD, Asperger Syndrome and autism by increasing their focus on specific activities. Meg's brother was diagnosed with ADHD as a child so she is well aware of how the rings will benefit these individuals. Meg also offers a specially discounted Classroom set (below) for teachers who have to deal with fidgety young children all the time! 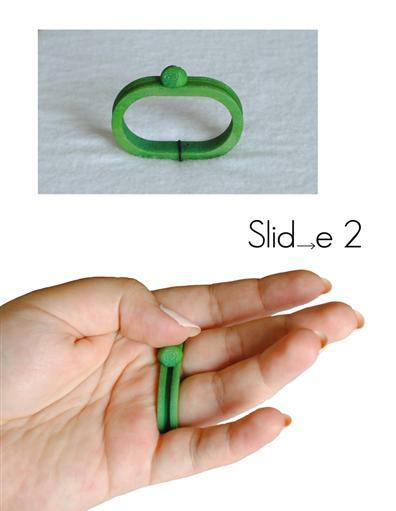 If you'd like to win a Slide 1 Fidget Ring (your choice of size and color), please make a comment below. Make sure you leave contact info below if you do not have an online shop or blog. It ends in a week's time at 6 pm EST Monday, February 16, 2015 . I will pick the winner randomly and announce the results as soon as possible after. So be sure to leave a contact email if you don't have an online link or make sure you come back and check! Otherwise I will redraw in a week. Good luck! Thanks for hosting the giveaway! I absolutely love these Kinetic Rings! They are such a fantastic original design! these rings are so awesome! I would love to win one for my son, who has ADHD. I'm a blog subscriber, FB and twitter follower. I have shared this on FB and twitter. I wear a chain maille ring that I made. It fits nicely but I'm always turning it round and round. My fidget ring I guess. Love these designs. Need one for my brother-in-law who has the leg shake fidget. Count me in please! These rings are very cool. I wear a spinner ring all the time already. I'm major fidgeter. I am so impressed I'm speechless and you know that's not me Pearl! I fidget. I can't help myself. Always need to do something with my hands. So throw my name in there Pearl! This is a great giveaway and idea! My son has Aspergers and ADHD, and we have been looking for a fidget item for him. Most are ineffective, or become more of a distraction or he doesn't like it. These rings are a great idea and fit the bill. I hope I win, but I'm going to order some anyway. Thanks for such a truly innovative and helpful giveaway! I also subscribe via email . These are great! I have stress related myoclonus and could use a way to help refocus. Better than a worry stone. Jill - earwear@ihug.co.nz - so I am international from down under !! I work with autistic and ADHD kids. I would love to try one. How cool! These are fabulous ! I'm such a fidget ! Blog subscriber and shared on FB ! Love the ring, would be nice to win one. Great idea! I know so many people who could use this. 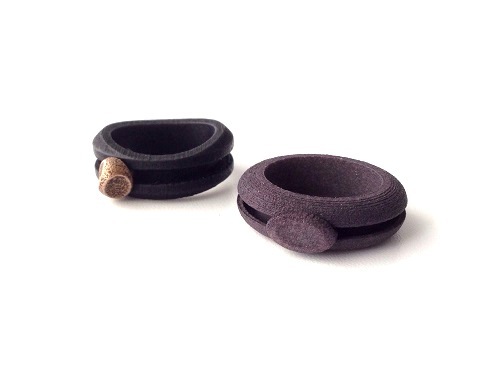 I think Meg's fidget rings are a fantastic product for their design and functionality. As an occupational therapist I see many fidgety kids and often recommend these rings. They are unlike any other fidget option available because the child can wear it anywhere (even school), has access to it 24/7 and the design means a child can fidget inconspicuously and one-handed. I have not found this degree of functionality in any fidget option for kids (and I have seen a multitude of different fidget toys). Can't wait to see the new designs she brings out! This would be perfect for me. I am sooo anxious all the time. I forgot to add that I am a blog subscriber. Man do I love this idea of kinetic jewelry! Both my son and I are fidgeters... never stop moving our hands. But my daughter's boyfriend is by far the most kinetic person I've met. My daughter bought him a beautiful watch for Christmas and he is constantly clicking and unclicking the clasp and sliding it on and off his wrist. I think the ring with the beads that slide back and forth would be wonderful for him! He could wiggle his fingers back and forth inside his hand to burn off that excess energy, without worry of wearing the piece out. I would love to win one and give it to him! I am a teacher and would love to have one for my classroom. Interesting article. Would love to win one of the rings. I work at as a social worker in an elementary school and we are constantly looking for "fidgets" for our ADHD students, these would be great!! I am an adult with ADHD and have had it my whole life. I am currently a college instructor and have had my students comment on how much I fidget...this would help so much! Would love to get one of these for a friend and long-time fidgeter! where can we purchase a ring from? Just check the links given above. I am an occupational therapist working in a large school district where we are always looking for fidgets that 1. will not get lost easily 2. Can be used without distracting a student from school work. 3. Are not noisy or otherwise distracting to other students. Your designs seem to meet those three important qualifications. If you would like me to try some out and review them, I'd be very interested in helping you and my own students. Please contact Meg, the designer of these kinetic rings which I reviewed her, through the link in the above post.